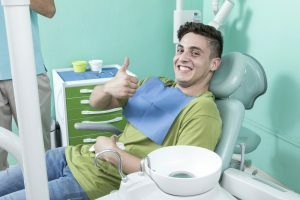 If one cavity is a concern that your Sheridan, WY dentist needs to address, what can happen if you find yourself needing treatment for several cavities? This is a scenario people can face when they go an extended period of time without oral health care, as decay can go unchecked even as multiple teeth develop problems. Fortunately, your dentist is ready to work with you to fully rehabilitate your oral health. After identifying the most serious issues, your dentist can work through all of the dental problems that affect you, until your smile is in full health. Every time you receive a routine dental evaluation, your dentist is looking carefully for any evidence of cavities. These reviews can turn up small cavities that have not caused you discomfort, so you can have the amount of harm done to your tooth limited. People who skip dental exams can fail to realize when decay reaches the stage of a cavity. After a longer absence from the dentist’s office, you may have several cavities that have to be addressed. The type of care required for each one will vary based on how serious it has become. When you undergo treatment for a cavity, your dentist has to think about more than just the removal of harmful decay. The damage done to a tooth will be permanent, which means a permanent restoration is required to properly protect your tooth. Smaller cavities that affect your enamel can be addressed with a dental filling, which will occupy the area where your infected tooth structure was treated. If the cavity is larger, your dentist may need something larger. In these cases, a dental crown can completely cover your tooth above your gum line, and keep it safe. Crowns and fillings can be constructed to fit in with your smile, so you do not have to worry about permanent cosmetic issues. After a long break from the dentist’s office, your dentist may be worried about more than just tooth decay. You can also receive care for issues like dental damage, or discomfort connected to TMJ dysfunction. Your dentist can determine what kind of care you require after a long break in care, and help you outline a plan to restore your smile. Grinnell Street Dental is ready to help patients fully restore their teeth when they have issues with multiple cavities. During your full-mouth rehabilitation, you can enjoy quality care that gives you more confidence in your oral health, and your smile! To learn more about Grinnell Street Dental, or to make an appointment with one of our doctors, contact our Sheridan, WY, dental office today at (307) 672-7567.